The "clay tempered" is generally known as the "soil-burning edge". It was passed from the early Tang Dynasty. 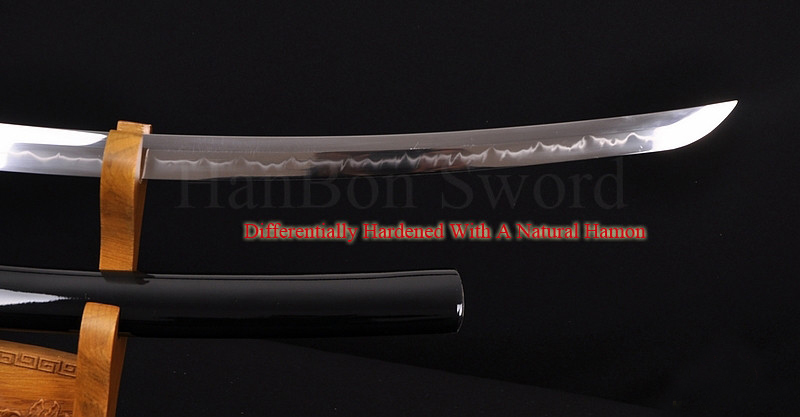 Japan used the forging process that was very critical in the process of forging swords since ancient times. The swordsmith first uses the powder of clay, charcoal and grindstone to modulate the burnt soil , then the blade is wrapped with it. The soil of the blade is thinner, and the soil of the pick and the building is thicker. Basically, the distribution of burned soil can be seen from the blade of finished products. There are different compositions and modulation methods for different genres. The sealed blade will be placed in the fire at 750 - 760 degrees Celsius. According to his experience, the swordsmith judges the temperature of the furnace by the color of the flame. If the temperature exceeds 800 degrees Celsius, the strength of the sword will be affected. After a specific heating time, the swordsmith will put the blade into water and cool down rapidly for another process. Through this step, the blade becomes harder and sharper. The rapid heating and cooling causes the curve of the blade, and the surface of the blade generates a very strong "Madens crystal" or "Martensite". Because the high temperature crystal structure becomes cold suddenly, carbon atoms are locked in the grain and produce the state of "metastable" , so there is a great internal tension between the crystals, which results in the "hard" effect. Through this step, a grainy hamon resembling silver sand is produced at the boundary between the blade edge and the blade surface. On the whole, these tiny white dots form white fog lines, which is an important basis for appreciating the quality of a Japanese sword. Due to the very high technical requirements in this step, a slight negligence may cause the blade to crack, which will cause a fatal injury to the whole blade. In addition, even if it is barely formed, it may not produce beautiful hamon. Now many fake hamon are pickled, or milled out, and some are made very realistic. The hamon is formed through a strong heat treatment. Severe temperature changes form Martensite crystals, which can be seen from many angles of the sword. Grinding and retaining the full blade line is shiny and has a significantly higher reflectivity than the rest of the blade. In fact, it is easy to identify true and false burns, the premise is to be able to understand what is the clay tempered. The blade is burned out, relying on the grinding to restore the original appearance. After heat treatment, the different metallographic structure on the surface of the blade has different light reflection characteristics, rather than grinding to make a certain shape. The false hamon are ground and edged with different fineness abrasives and different grinding directions, resulting in different reflection effects on the light. What we see is just the difference between scratches of different thicknesses and directions.